On my list of things I have patiently waited to start, launch or act on…. Work with Julie in a pilot to bring one of her amazing Astrology classes online in November. 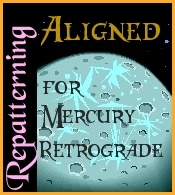 During this past Mercury retrograde, I did have a few stumbles, but easily flowed around them – Did not have my debit card at the checkout of a store, mild panic, but found it quickly at home and went back to the store. The delay, took me into the time of day when the library would be open so the second trip the Library run was accomplished as well. I made pattern alterations as noted above and while I thought these were an easy 1 hour job, it took days. However, the gift here is that in puzzling over the fixes, i managed to resolve a long standing issue to accommodate narrow shoulders. It was a huge insight. A lot can happen when we are aligned.